Star Wars Celebration has officially begun! For everyone who is there at Chicago, I hope you enjoy it. The panels and the livestreams won’t start until tomorrow, giving the opportunity to look ahead to what is happening across the next four days. And first off, I’ve confirmed how I’ll be covering it all. Each day will have its own post, talking about everything that happened on that day on the livestream. There’s been the main events already confirmed as appearing which will bring a good amount of talk, but extras such as other panels being shown and interviews with guests are sure to bring even more. In many people’s eyes, the big event starting Celebration off on 12/April will be the Episode IX panel. Offering a look at what the final film in the trilogy holds for these characters, and offering up some surprises and insights for the film itself. The panels for the previous films have certainly given chills with their trailers – whether through nostalgia or mystery. There’ll be plenty of details to look over when this one starts at 11:00 CDT / 17:00 BST. Also confirmed for the livestream on the day are a first look at the VR series Vader Immortal at 13:30 CDT / 19:30 BST, where we’ll be finding out about the technology, design, and story that have gone into immersive look at Vader’s Mustafar fortress. At the same time is 20 years of LEGO Star Wars, taking a look at the history of everything LEGO Star Wars, as well as what’s coming in the future. While the exact time this will be shown on the livestream isn’t confirmed, it will be shown some time on the day. There’s also The Creatures, Droids, and Aliens of Star Wars panel that will look at the creation of the new era of creatures, droids, and aliens with a deep dive into the designing and crafting of them from inside the Pinewood Studios-based creature shop. This looks to be a great behind-the-scenes look when it starts at 16:00 CDT / 22:00 BST. Other panels of the day include the look at Hasbro’s future offerings at 15:00 CDT / 21:00 BST, The Music of The Phantom Menace at 15:30 CDT / 21:30 BST, the LucasFilm Publishing panel at 16:45 CDT / 22:45 BST, ILM Presents: Making Solo at 17:30 CDT / 23:30 BST, and even a game show where fans can go head-to-head against popular authors at 18:30 CDT / 00:30 BST [I’d so love for this one to be on the livestream, but unfortunately it will probably miss out]. Bringing Galaxy’s Edge to Life at Disney Parks is the headline panel of 13/April, giving insights into this new interactive experience being built at Walt Disney World Resort and Disney Land Resort. In case you didn’t know, Galaxy’s Edge will be a whole Star-Wars themed area within the parks that will make you feel as though you’ve just stepped into the Star Wars universe. There’s already information released on the Disney Parks website, but this panel should give a deeper look at how it’ll all come together at 11:00 CDT / 17:00 BST. 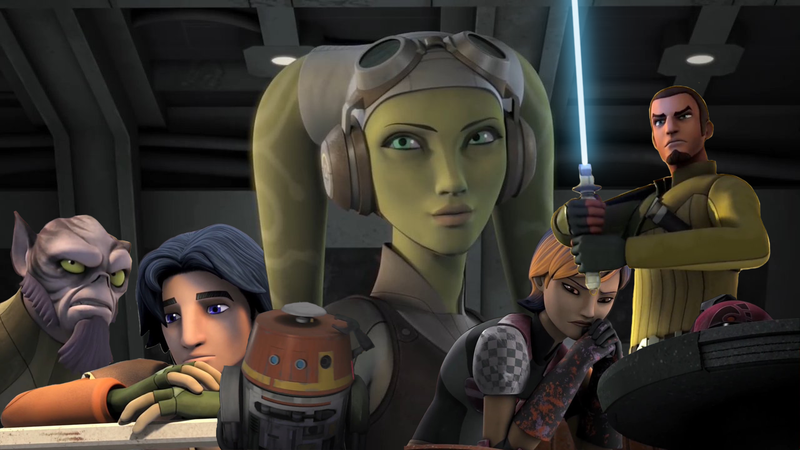 The Rebels Remembered panel is set to look at the history of the show and all four of its seasons. The crew are set to reunite for a chat about their favourite things and behind-the-scenes look at the series, and there’s bound to be some other guests joining them. But full disclosure – a new show will not be announced here. While the panel itself starts at 12:45 CDT / 18:45 BST, it won’t be on the livestream until later, as it overlaps with a certain Galaxy-Wide Premiere. EA return to Celebration to present something that’s been floating in the void for almost an entire year since it was announced at E3 last year. Jedi: Fallen Order is set to finally be unveiled and it’s quite possibly one of the things I am most excited to see. Set after Revenge of the Sith and the call of Order 66, it follows a young Padawan on their journey to survive in a galaxy where being a Jedi means a death sentence. The Order will fall starting at 13:30 CDT / 19:30 BST. Other panels of the day include Inside Fantasy Flight Games at 11:00 CDT / 17:00 BST, the Behind the Scenes of Del Rey Books at 12:45 CDT / 18:45 BST, Marvel Comics’ content at 14:30 CDT / 20:30 BST, a Celebration of Women and Star Wars at 16:00 CDT / 22:00 BST, and A Star Wars Let’s Play at 17:30 CDT / 23:30 BST [another I wish would get streamed, as it’ll feature classic Star Wars games]. The panel headlining 14/April is also a big one, but it’s by no means the only big panel for the day. The Mandalorian is set to hit Disney+ - the streaming service of Disney that’s falling in autumn, and this will be the panel showcasing what the TV series is about. Set in a time after the fall of the Empire, the focus will be on a world far from the New Republic. More info will come starting 11:00 CDT / 17:00 BST. The Clone Wars will also be coming to Disney+, and a new season is set to be unleashed upon the galaxy. We know of one arc that’s set to be coming, as it’s an important one. The Siege of Mandalore has been talked about before during Celebration panels, and has been referenced in other Star Wars media, as it is a pivotal battle from the end of the Clone Wars. That arc will be featured within the twelve episodes of the coming season, and we’ll probably find out all of the coming arcs at 15:30 CDT / 21:30 BST. While not confirmed to be on the livestream, Sunday also features panels with two beloved droids. OOM-9 and a Gonk droid. As funny as that would be to see, it unfortunately won’t be happening. At 13:30 CDT / 19:30 BST, Warwick Davis will be joined on the Celebration stage for a talk with Alan Tudyk about K-2SO and other memorable characters from his career. 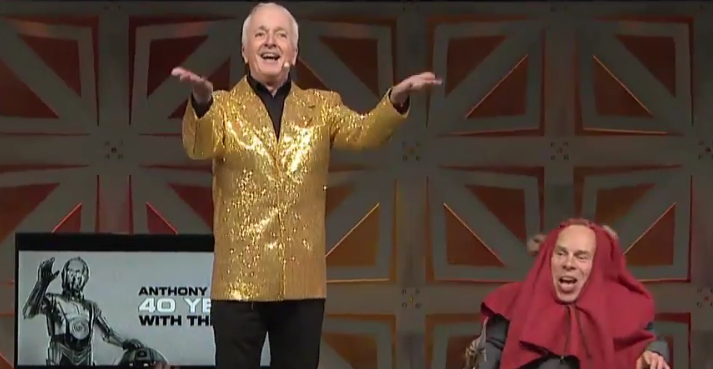 Once again heading up on stage, though sadly not with Warwick Davis this time, is the most wonderful droid you could ever meet – Anthony Daniels. Fun and mayhem always follows wherever he goes, but he’s a kind hearted droid providing a good laugh. The man behind C-3PO is certainly going to have a good show again this year at 17:15 CDT / 23:15 BST, even if he can’t play off Warwick Davis [though there’s still a chance of that if Daniels joins that fake droid]. It’s the 20th anniversary of The Phantom Menace, and so Celebration will be celebrating that. While there’s some smaller panels dedicated to its celebration littered throughout the other days, the headline panel for 15/April will bring cast members together for a look behind-the-scenes and a sharing of memories of the filming of the set. That kicks off at 11:00 CDT / 17:00 BST, and is sure to give a lot of interesting facts behind the start of the prequels. A look at season two of the TV series Resistance comes at 13:30 CDT / 19:30 BST. This series has been getting stronger throughout its first season, and the second is set to pull the characters into further action with the First Order. I haven’t seen much from this one yet, but I’m excited to see what’s happening in the upcoming season. Warwick Davis is set to host his own show at the same time on the Celebration stage, and he’ll be providing a good dose of entertainment and bragging rights of having been behind the most characters of the Star Wars universe. If Anthony Daniels doesn’t appear with Alan Tudyk, I’m pretty certain he’ll appear here. Unfortunately, there’s every chance we won’t get to see it. And where would Celebration be without its Closing Ceremony, playing host to memories of not just this Celebration but the history of Celebration events. As well as being the 20th of The Phantom Menace, it’s also the 20th of Celebration. There’ll be plenty of guests giving their memories from those previous Celebrations, and it’s a farewell to the weekend that will be remembered when ends it off at 15:30 CDT / 21:30 BST. That’s certainly a lot, and for those at Celebration there’s even more to get stuck into with all the guests around for photo opportunities and autograph signings, and the fan panels, shops, and meeting with other fans. No matter whether at the event or watching the happenings on the livestreams, all Star Wars fans will be united in Celebration this weekend.